The only way to learn singing is to do singing: So why should you study with us? Intimate class sizes and regular performance opportunities. A friendly and supportive department where you will be challenged, inspired and encouraged. The chance to perform principal roles in our thrilling stage productions at undergraduate and postgraduate level. The opportunity to sing with our critically-acclaimed Chamber Choir, the only UK conservatoire choir to record on a regular basis. 90 minute singing lessons per week for first-year undergraduates. Here at Royal Birmingham Conservatoire we believe that students benefit enormously from our learn-by-doing approach. Your time in the Vocal & Operatic Studies Department will be no exception to this. As well as receiving extensive tuition from world-class teachers and professionals you can expect to have a wide variety of performance opportunities - including the chance to perform in our staged productions - from the moment you walk through our doors. We also firmly believe in a bespoke training for our young singers. To this end, our comprehensive course of study has been designed to allow you to focus on your individual passions, whilst providing you with the toolkit for life in today’s profession. Whether you see yourself on stage, in our critically-acclaimed Chamber Choir or in one of our innovative VoxBox song recitals, we will be proud to offer you a flying start to your career as a successful singer by nurturing and guiding your own unique talents. Singers are storytellers. Here in Birmingham we keep this belief firmly in our sights at all times. To be a good storyteller, however, requires more skill than you might think. A rock-solid technique, a flawless facility with languages, a quicksilver imagination, and an ability to engage with singing as a whole-body activity all have a part to play in the thrilling communication of a good narrative. We are proud to offer guidance in all these areas with our team of highly-experienced teaching staff. Song classes: intimate class sizes mean you get the chance to perform on a regular basis. Languages: Italian, and from 2nd year onwards, French, German and Russian (optional). Stagecraft, Movement and Yoga classes. The ability to create a portfolio career – one in which you feel comfortable operating in a wide variety of contexts – has become an essential part of life after graduation. We believe that we serve you best by offering a broad range of activities at a high-level, enabling you to then choose which areas of expertise you would like to specialise in. So, when you find yourself performing La Bohème in a pub on Monday, recording with a consort group on Tuesday and leading a workshop for 7-9 year olds on Wednesday, we hope you will be able to credit us for helping you to feel competent and comfortable whatever the scenario. Coming to the Conservatoire was the greatest and most rewarding thing I have done. The support given to me throughout my course was brilliant. We understand that strong foundations are essential for any successful singer. If you are planning to join us as a first-year undergraduate you can expect to receive 40.5 hours of individual singing lessons in your first year. That’s 1.5 hours a week. How you split that time is entirely up to you and your teacher but most students opt for two 45 minute lessons a week. This little-and-often approach allows you the room when you most need it to work on technical issues and to set up your voice so that it fulfils its potential both during your time with us and beyond. After your first year you can expect to enjoy an hour a week with your teacher working on the areas that matter most to you. The Chamber Choir, principally conducted by Paul Spicer, is a group of some twenty-four auditioned student singers who form an expert and flexible group. Expectations are high as their reputation grows nationally and internationally. They record almost every year for Somm Records, give concerts in Birmingham and further afield, and make occasional broadcasts. The choir is unique amongst all the UK’s conservatoires in having a significant recording presence; they have now made nine CDs in recent years. Their latest disc of music by Richard Rodney Bennett (almost all first recordings) won critical acclaim in Gramophone magazine; it described the choir’s singing as ‘splendidly disciplined and infectiously fervent’, adding, ‘all involved with the making of this CD can be very proud of their efforts’. The choir’s disc of rare choral music by Herbert Howells was ‘most impressive’ (MusicWebInternational) and was an Editor’s Choice of the month in Gramophone. Their disc of music by John Joubert received an enthusiastic 15 minute appraisal on Radio 3’s Record Review programme. The choir’s Radio 3 debut came in 2015 when the BBC recorded a concert from the Ludlow English Song weekend. Jeffrey Skidmore, Director of Ex Cathedra, takes the group for one project in each academic year. They focus on early music and Jeremy often introduces singers to his specialist area of French baroque repertoire. 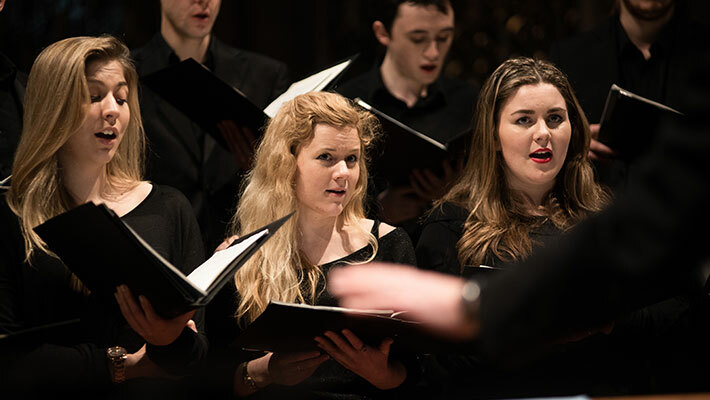 In short, our Chamber Choir is an ideal training ground for singers who wish to pursue singing in professional ensembles like The Sixteen, The Monteverdi Choir, Tenebrae and Polyphony. A number of our singers have also been selected to sing with Gemini Sixteen. A further group, Camerata, is also open to any students wanting to gain further experience in small ensemble singing. Participation in such a group brings much improved aural and sight reading skills. Camerata is directed by our postgraduate Choral Conducting students and overseen by Paul Spicer. The choir sings a varied repertoire, performing two or three times in the year. 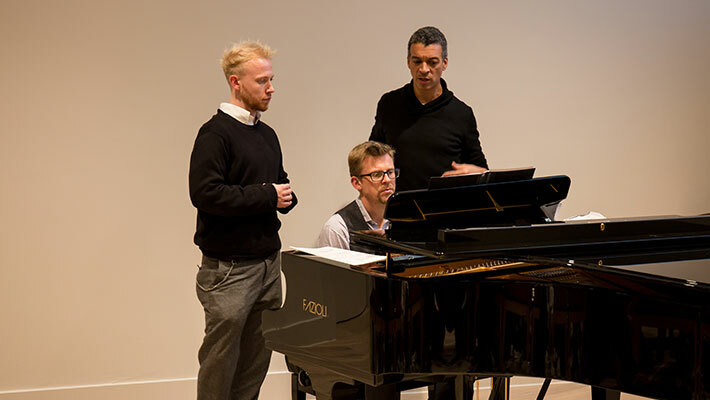 Here at the Royal Birmingham Conservatoire we are unique in providing unparalleled operatic performing possibilities at both undergraduate and postgraduate level. Each year we perform a set of Opera Scenes and two fully-staged operas. 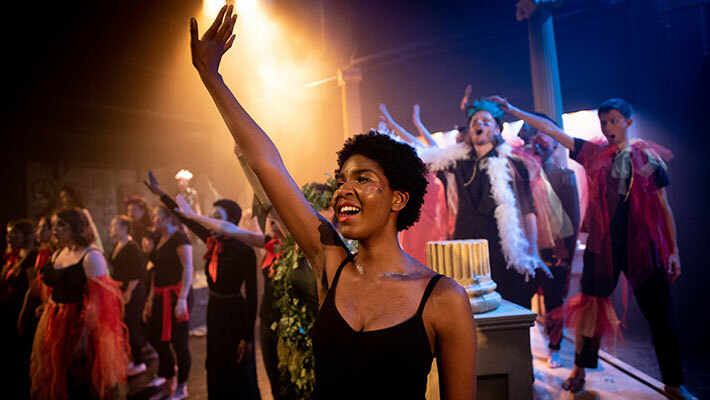 Students from their second year upwards have the opportunity to audition for principal roles in these productions and first year students are often involved in the chorus. 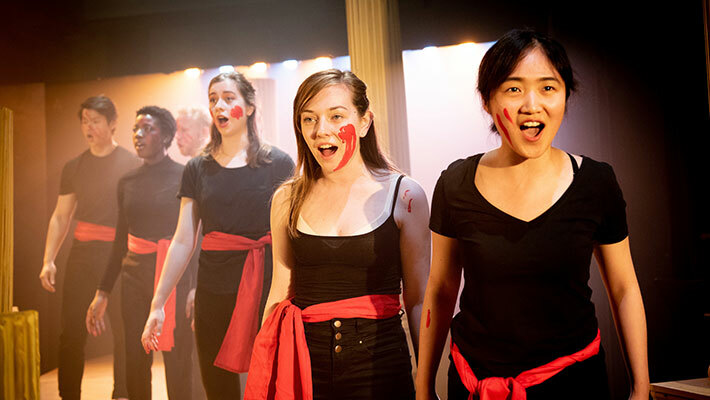 Productions are carefully chosen with our students' best interests in mind so that you can expect to sing in operas which will challenge you to an appropriate level without pushing you beyond your current capabilities. You can study Opera Repetiteur at postgraduate level. If you see yourself on the concert platform why not get involved instead in one of our innovative VoxBox concerts which combine song, poetry and sometimes drama in new and innovative ways. Fancy giving your recital a dry-run? Then sign up for an informal concert slot where you decide how private or public you want to make it. On your first day with us you will find a real atmosphere of inclusiveness within our department. We consider it essential that you learn in an environment which, although inevitably competitive, is one in which there is understanding and support between all students. We demand a lot of our singers, but it is our strong belief that you perform best when you are given permission to make mistakes and permission to play. In return we only expect your commitment to all that is on offer here. If you feel you would thrive in this unique, stimulating environment we look forward to welcoming you!